Raghu Tadepalli began service as dean of the Martha and Spencer Love School of Business in July 2012. 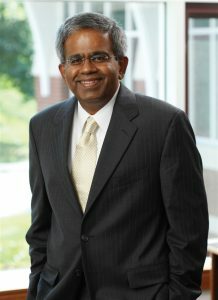 Tadepalli came to Elon from Babson College in Massachusetts where he served as Murata Dean and Professor of Marketing in the F. W. Olin Graduate School of Business, successfully leading a major overhaul of the MBA curriculum at a school renowned for its graduate programs in entrepreneurship and business administration. A recognized scholar in the field of marketing, he has written or contributed to many peer-reviewed journal articles and presentations on cross-cultural ethics, evaluation of performance for purchasing agents and salespeople, and the factors that affect salespersons’ customer orientation. Tadepalli enjoys working with Elon’s outstanding faculty and staff who are advancing a vision of the Love School as a transformative leader in business education. “Our collective goal is to provide our students with an educational experience that transforms them into knowledgeable, responsible business professionals and leaders who make a difference in their professions, their organizations and the global economy,” Tadepalli said. Prior to his tenure at Babson, Tadepalli was dean of the Graduate School and associate dean in the Williams College of Business at Xavier University. He led successful re-accreditation efforts for the Williams College of Business, and under his leadership the Xavier MBA program added two new off-site MBA programs. Tadepalli also was chair of the marketing department at Xavier prior to being named associate dean. He served as co-editor of the Journal of Marketing for Higher Education and has taught marketing strategy at the undergraduate and MBA levels, and international business at the Executive MBA level. Tadepalli also taught at North Dakota State University and the University of Illinois at Chicago, winning numerous awards for his teaching, research and service. The students of the Williams College of Business named him “Delta Sigma Pi Teacher of the Year” in 2003. His research has been published in such journals as Psychology & Marketing, European Journal of Marketing, Industrial Marketing Management, Journal of Applied Behavioral Science, Journal of Managerial Issues and Managerial and Decision Economics, among many others. Tadepalli has a bachelor’s and a master’s degree in commerce with a major in accounting from Andhra University in India. He completed his Master of Business Administration degree with a concentration in marketing from Arizona State University and later earned his doctorate from Virginia Tech.